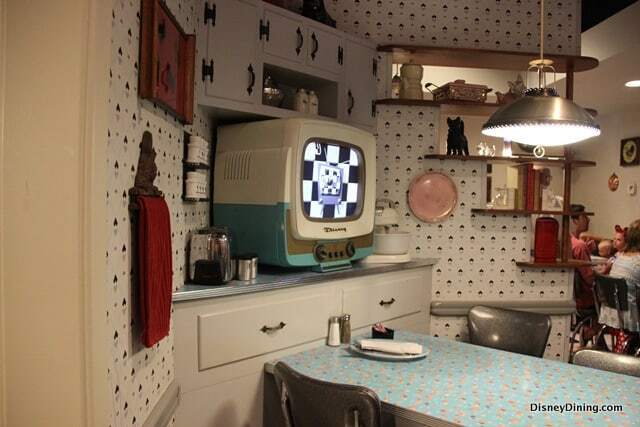 50’s Prime Time Café evokes memories of 1950s America, even for those of us who did not live through that era of squeaky-clean kids, home-made dinner every night, and black & white TV. 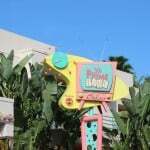 This restaurant at Disney’s Hollywood Studios is a must-do for my family every trip. 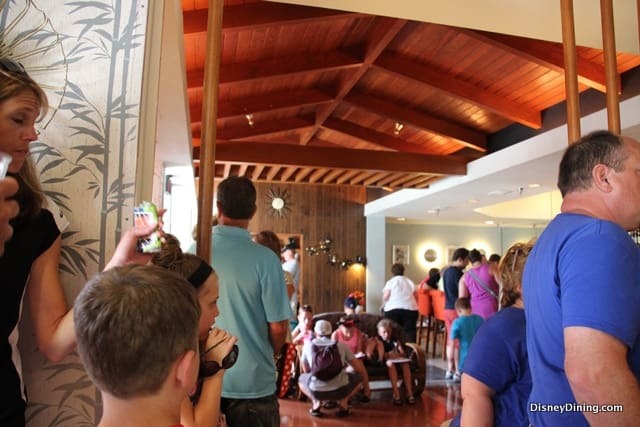 From the atmosphere to the food it is a fun dining experience for everyone! 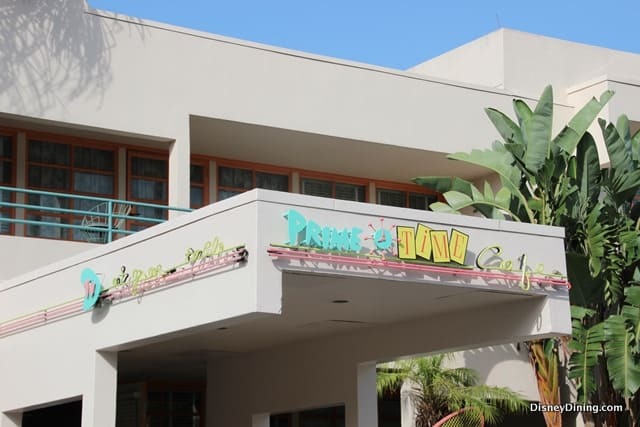 Your meal at 50s Prime Time should start well in advance of your park visit. 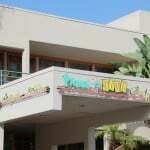 Although this restaurant doesn’t fill up with reservations at exactly the 180 day mark, you will want to call or log in ahead of time to secure your preferred dining time. 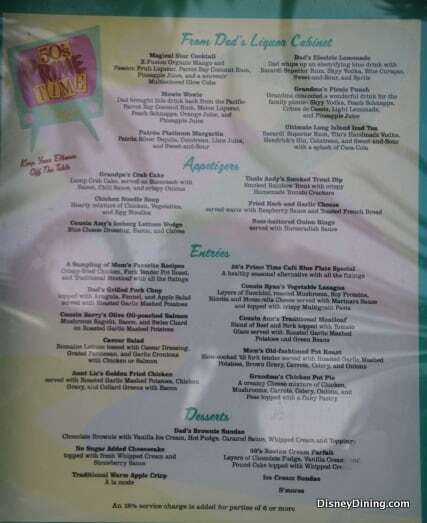 Lunch or dinner doesn’t make any difference at this restaurant—it is the same menu, so plan accordingly with what will work best for your park touring. 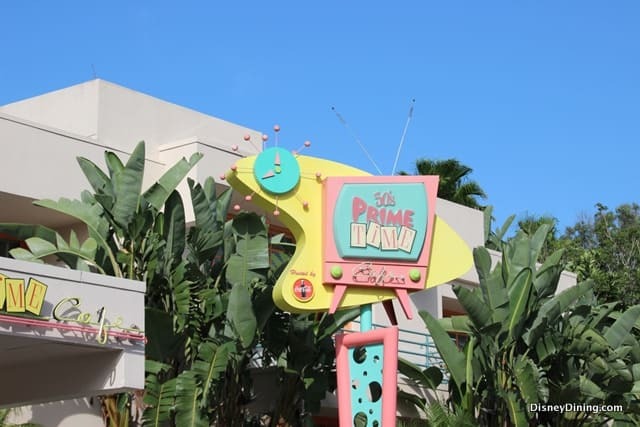 50’s Prime Time is located in the Echo Lake area of Disney’s Hollywood Studios. Take a left off of Hollywood Blvd. and you will pass Hollywood & Vine first, then you will come to 50’s Prime Time on your left. It is very close to the Indiana Jones Stunt Show and Dinosaur Gertie. 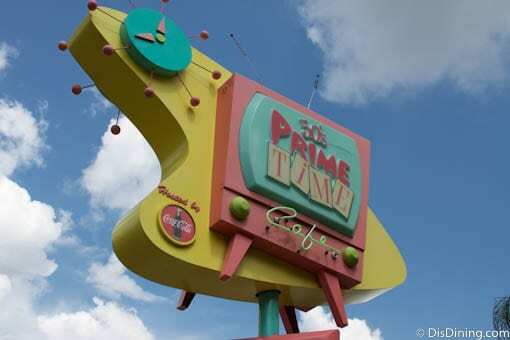 On our recent vacation my family chose to return to Hollywood Studios one evening primarily to eat at 50’s Prime Time Café. 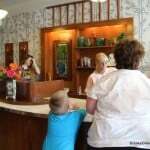 We checked in a few minutes before our scheduled reservation time and waited in the overcrowded lobby. 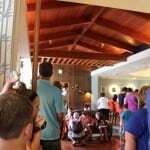 This is my one complaint about this restaurant—the check-in and waiting areas are chaotic because they are not large enough. 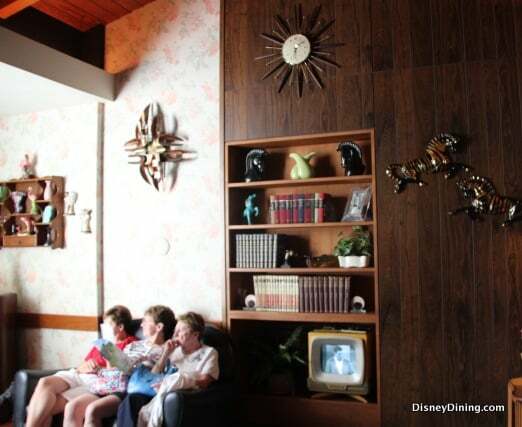 The waiting area is fantastically themed and many of the knick-knacks remind me of my grandparents’ basements (hold overs from the 1950s). The details are great, and I love to walk around and look at everything, unfortunately it is usually too packed to do this. 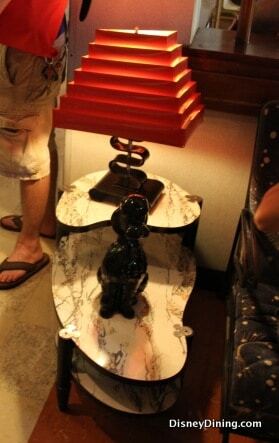 The Tune In Lounge also shares this area contributing to the noise and crowd. When your table is ready the hostess calls you to your table “Chapman Kids Mom is Ready for You!” A nice touch to prepare you for the theme at hand. 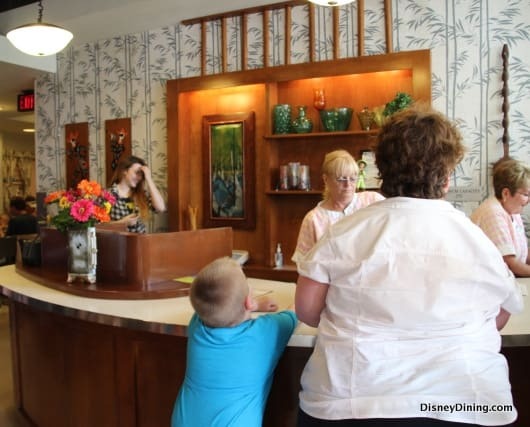 There are several seating areas available in the restaurant, and again they are well themed with incredible details harkening back to the 1950s. 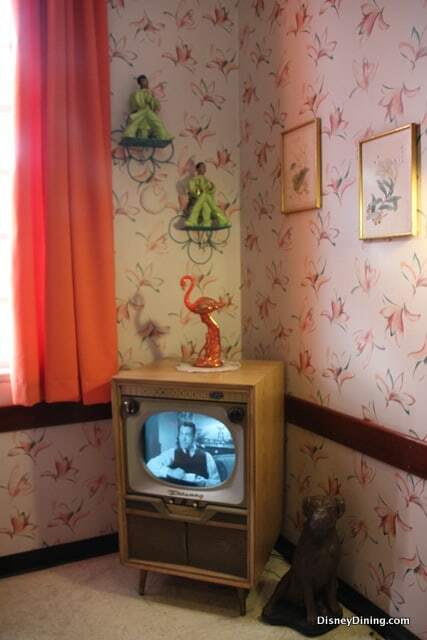 Probably the most coveted are those tables that look like a kitchen bar extending from a counter with a TV. But, if you don’t get one of those tables don’t worry, you can see TVs from just about anywhere in the restaurant, and the theming is everywhere too. 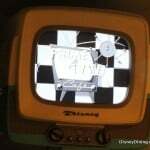 The black and white TVs play a loop of favorite 1950s television shows, along with a few Disneyland excerpts here and there (like Walt’s speech opening the park in 1955). They are fun to watch and help to keep everyone entertained while waiting on their food—although I’ve found 50’s Prime Time to be very quick service from seating to service. 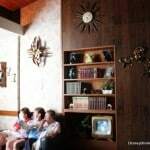 The wait staff are in character for your meal—either your cousin, your aunt, your uncle or some other family member who is more than happy to fuss at you for having your elbows on the table, force you to eat your vegetables, threaten to tattle to mom, or put you in the corner for disobeying house rules. 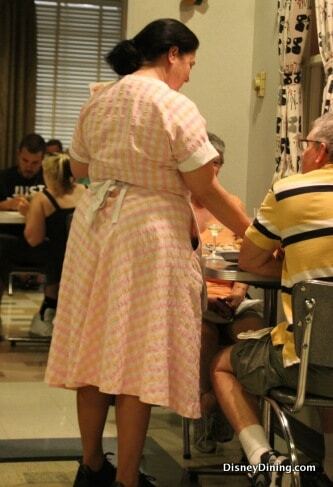 Their costumes are also reminiscent of the 1950s—something you might find in a diner or soda shop of the time. 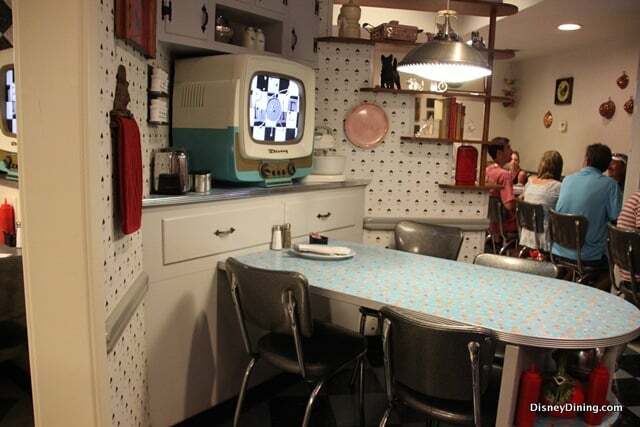 50’s Prime Time Café features a tasty menu of comfort food just the way mom used to make it. Our favorite is the Fried Chicken. We like to substitute the green beans for the greens advertised with the dish, and mom doesn’t seem to mind (as long as we eat them all). Other “home-style” favorites include meatloaf and pot roast—in fact you can select a sampler plate with all three of mom’s favorite recipes! We started with the Fried Herb and Garlic Cheese—this menu favorite was gone for a while, but I’m happy to report that it is back and delicious! 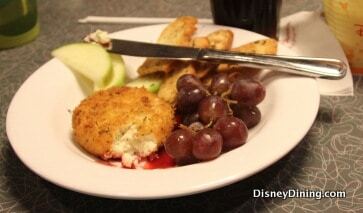 It is served warm with Raspberry Sauce, toasted French bread, and fruit (apple slices and grapes). Rich and creamy this was so good! 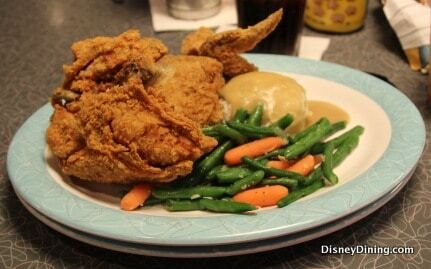 Everyone chose Aunt Liz’s Golden Fried Chicken for our entrees, served with mashed potatoes and gravy and green beans. YUM! 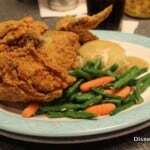 The chicken is very tasty—golden and crisp on the outside, tender and juicy on the inside. 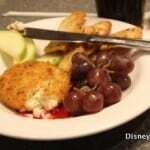 We also ate at Hoop Dee Doo Revue on this trip, and the fried chicken at 50s had a similar flavor, but was prepared better than Hoop Dee Doo. The green beans are cooked well—not too limp and not too crisp, flavored with some garlic. The mashed potatoes aren’t anything spectacular, but they are good comfort food. There is no wonder I keep coming back to this dish each time we eat here. We were too full for but the table next to us ordered the Smores and they looked just as yummy as the last time we ate them. 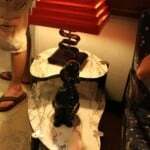 The Apple Crisp also looks good and I would like to try it on a future visit. 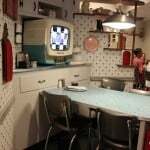 Our server was a good balance between the “character” of 50’s Prime Time and not embarrassing for our teenage son. 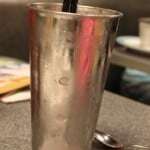 She did pick on us a bit as my 10-year-old son egged her own by putting his elbows on the table every time she walked by, but wasn’t over the top like some of the servers we’ve had or observed there over the years. Some of them seem to have so much fun doing their job! 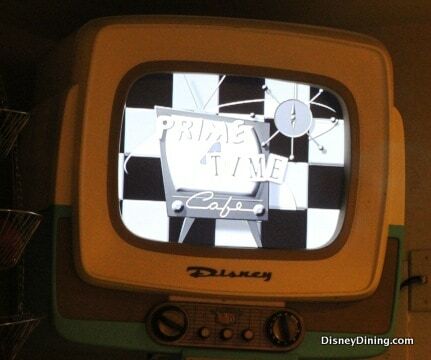 For all of its atmosphere and theming alone, everyone should try 50’s Prime Time Café at least once during their Walt Disney World visit(s). 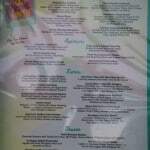 Throw in a familiar menu of well-prepared comfort food that is quite different from most other theme park restaurants and you have a winner every time. Thanks Mom! Food: Delicious! 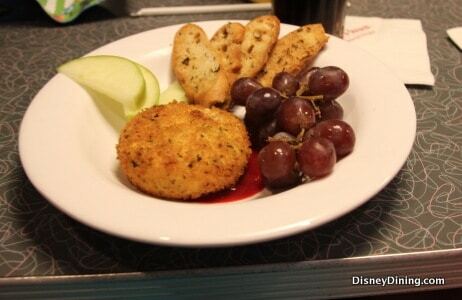 Comfort food at its best (in a theme park setting at least). Although healthy alternatives are offered, cut yourself some slack and go with one of the house specialties. You are doing a lot of walking in Disney anyway, right? 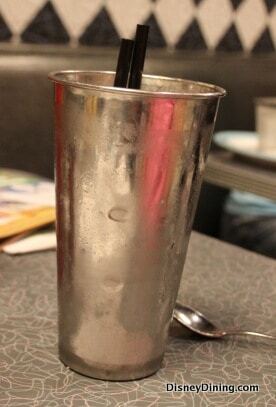 And who doesn’t want to sit down to freshly prepared fried chicken and a milkshake? Atmosphere: Top-notch Disney theming at its best. I am sure the Imagineering Design Team who put this place together had a blast shopping for all of the tchotchkes, doo-dads, and knick-knacks, not to mention the large furniture pieces, wall hangings and kitchen accessories. 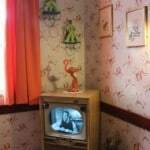 The 1950s TV shows are a hit, and the additional fun had with the servers make the atmosphere something everyone will want to experience. 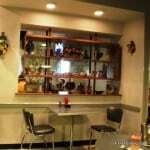 Service: “Normal” service is quick and efficient, not much waiting between seating, ordering, and receiving our food. 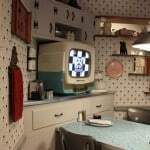 In addition, the servers are in character as a family member from the 1950s and their fun-spirited ribbing makes for a fun, interactive evening. 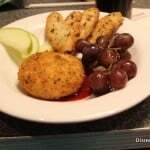 Tips: Order one of the comfort foods from the menu—calories don’t count in Disney. The Peanut Butter and Jelly shake is delicious too! Interact with your server—it will make your experience more fun for everyone. And don’t forget to make your dining reservation early—although 50’s Prime Time doesn’t fill up on the 180 day mark, they do fill up and you don’t want to be turned away at the door.